While having a family may be the best thing in your life, the cost of raising one can be expensive. As the sole breadwinner, you need to provide all the basic needs, education, and even settle bills that come with the same. According to research, the cost of raising one child to adulthood is approximately £200,000. Just because raising a family is expensive for some people doesn’t mean you should run away from the responsibility. Whether you already have a family or are planning to have one, proper budgeting and prioritising are some of the best ways to keep everything running smoothly. 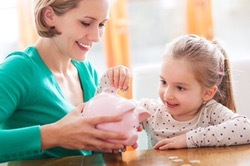 Some of the fun and savvy ways that can help you save money as a parent are discussed below. Supermarkets employ various means to reward their customers, with the reduced aisle being one of them. Many are the times when you will find food materials selling at reduced prices in different aisles as compared to others. Taking advantage of such reduced prices on food offers can help you save good money in the long run. This is particularly important for those who cook their food from scratch. Take some time to learn when these offers are available, and even spend some time in the supermarket to find these aisles. You can also save money by creating/cooking bulk meals (lentils and cereals), then freezing what is left. Kids don’t really bother knowing how or where you get their toys from. Instead of buying toys from big expensive shops, why not check out the local charity shops and other affordable places. The best thing about shopping for toys in local charity shops is you will always find a different variety of toys to choose from. Kids also love going to these stores” take them with you when you go shopping for the same. Cashback apps and sites offer fantastic ways to save money on anything you shop from their stores. Receipt Hog and Quidco are among the best sites to use for cashback offers and points. CheckoutSmart is also a good example of an app you can use to get a host of exclusive discounts and freebies on the market. By using these sites and apps, you get to accumulate points that can be converted into PayPal transactions, hence more money back into your pocket. You can also Google freebies and you will see lots of free stuff sites that offer good kids freebies to keep them entertained. Meal planning gives you perfect control over what makes to your dining table and also ensures you have well-balanced meals. Having a timetable for all meals can save your monthly food bills hence a wise idea. Most people spend more than they should when booking holidays. While you should avoid last minute rushes, waiting up until it is 48 hours to your trip can help find a cheap and affordable hotel wherever you wish to go. Holiday planners and even hotels will always have a spot to fill towards the ends of an offer, which gives you a perfect way to grab the spot and save money. You could also use Ebookers to help price match your hotel. eBay is not only a perfect place to get items for a bargain, but also provide you with an amazing way to convert unwanted items into some cash. Some people even make a career out of it. All you need to do is identify the items you wish to sell, create an account on eBay, set up a PayPal account, then wait for orders to trickle in. Selling items on eBay can help you save for major holidays such as Christmas and New Year. Have you found ways to save money? Pop a comment below if you have.